ЕКТА manufactured, assembled and launched 4 LED screens on the tower at Independence Square in Kiev, functioning both as a clock and as full-color multimedia screens. The reconstruction of the main national clock located at the Labor Union House at the Independence Square is complete. The old electronic clock had become obsolete – time and function-wise. Mounted over 30 years ago, that clock did not meet the latest level of standards in multimedia technology. Thus ЕКТА developed 2 new models of LED screens: LVM 24C4-E and LVM24C3-Е. Two out of the four screens have increased image brightness. The mounted video screens measure 7х3.9 m. They allow for the screen to produce a bright image even under very sunny weather conditions. This was facilitated by a unique screen brightness self-regulation system. The real pixel pitch for both models is 9.65 mm. Due to the automatic brightness adjustment system which responds to the level of external lighting, EKTA LED screens from the LED-Wall Outdoor series render equal image quality both under direct sunlight and in the dark. This system does not only ensure comfortable information perception, but also considerably saves power (up to 30%) and prolongs the lifetime of LEDs. And now the four screens mounted at the tower of the Labor Union House can display quality full-color video with sound. This means that Ukraine’s main clock has turned into the country’s TV set which will show news, live event broadcasting, weather forecasts, commercials and, certainly, the current time. 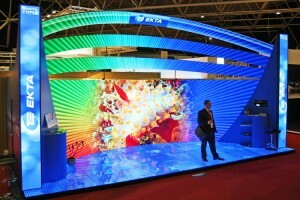 At #iseurope 2011 back in February EKTA was showcasing an impressive curved 3D LED screen. Glasses were required to capture the full 3D effect but it worked like a treat. This entry was posted on Monday, March 7th, 2011 at 07:24 @350 and is filed under DailyDOOH Update. You can follow any responses to this entry through the RSS 2.0 feed. You can leave a response, or trackback from your own site.